Can we go back to our childhood home? 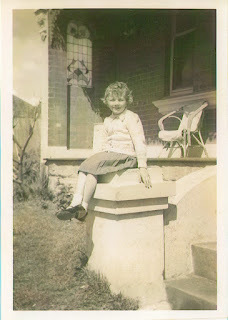 Judy G. Russell from The Legal Genealogists posted an interesting blog about going back to your childhood home, see the link below and it got me thinking about two of my childhood homes. One I know is demolished and villas are built on it the other, well I 'explored'. 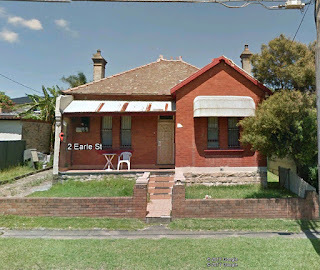 I spent the first nine and a bit years growing up in Earle Street, Arncliffe. I remember it as a good place to live, in the small street there were at least 10 kids, of varying ages, not counting the teenagers. I felt safe, was able to go and play and my mum would know where I was. I think life was simpler then. I'm not going to say safer, just that as kids we simply didn't know about the 'bad' stuff. I remember that the two teenage boys, across the road, would race their billycarts down the street, turning at the bottom, just before the main road. The street runs between two very busy roads and they were busy back then too. I remember the day the electricity people put in two massive posts, to hold a transformer, blasting away at the sandstone rock and us kids hanging over the fences, watching. Good memories. To me, as a child the yard was huge and had a slight slope in it and there were two large camphor laurel trees. 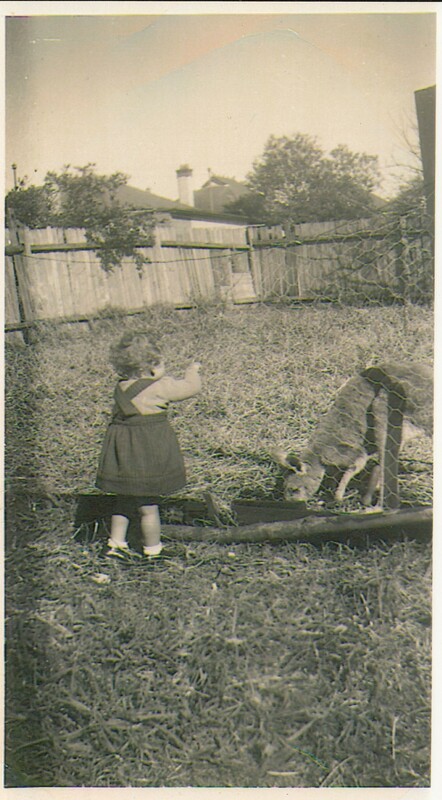 The back part was fenced of and Tilly or Milly, the kangaroos lived there. 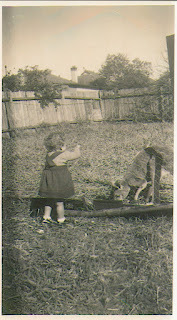 I had a sandpit, we had a lemon tree and a chook yard and an outside toilet. Me, as a cute young thing, sitting on the steps. You can see the window behind me. Me and Tilly or Milly. Fast forward to 2017 and the wonderful Google Street view and I nearly cried. I knew that there had been changes as years ago I went back, with our youngest, just to have a look. The wonderful patterned verandah had been tiled over with large brown square tiles but the stained glass window was still there. The fence is now bricks, the driveway looks the same and there are security bars on the windows. I searched for any real estate sales and found that it had been sold back in 2012 and that they had lodged plans to build four, two bedroom villas on the property. Hasn't happened, yet but the aerial view of number four, looks like they are doing something in the back yard, there. BUT, having looked at the real estate page I did learn some things. It was built in 1910 and the land area is 797 square meters. 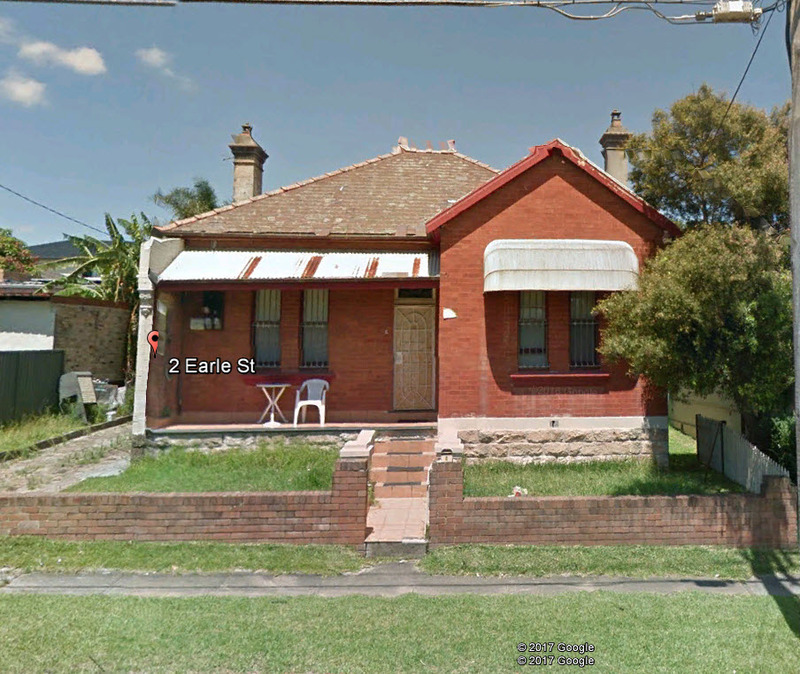 I then went to Trove and just entered the address and found 61 articles about things that happened either in the street or to people living in the street. It made for interesting reading, everything from weddings, to obituaries, to the sad articles about the suicide of a young man, living in the street. I found the names of two of the houses, Aberdeen and Frauenstein. Would love to know which one was Aberdeen. Frauenstein was number four. I wont go back and visit, this exercise has dulled my memories. The house looks old and tired, maybe it is time to say good-bye. Would you go back and visit your childhood home? 12 Ancestor in 12 Months; Elsie Minnie Ironside. Elsie Minnie Ironside was born 21 May 1892, to Maude Kidney and her husband Edgar Bird Ironside. Elsie was my husband’s grandmother. The Bridal Party. Alf Tobin (friend), Violet Ironside (sister), Frederick Sigrist, Elsie Ironside, Lilly Sigrist (sister), Norman Ironside (brother). Elsie and Frederick Charles Sigrist married in 5 April 1919 at St Michael’s Church of England, Flinders Street, Surry Hills. Elsie’s occupation was given as Saleswoman and Frederick’s a Telephone Mechanic. It was this occupation that would kill him, but you will have to wait until September to find out why. My Congress 2018, Days 1 and 2. At 10.00am on Friday 9 March 2018, at the International Convention Centre (ICC), Darling Harbour, the 15th Australasian Congress on Genealogy and Heraldry, began, with three concurrent sessions. And the choices were difficult, with a very varied range of topics. A1, was my first choice, with Jill Ball's Beaut Blogs: ideas for tarting up Geneablogs. What a fantastic session it was! Jill has such enthusiasm, for blogging that she really engaged her audience, especially as she used some parts of other bloggers, blogs. This was followed by a break and a chance to catch-up with friends, there only for the day. Back into the room and I attended the talk from the National Archives of Australia about Linking the Obscure. Very interesting, lots of useful information. A Lightbulb Moment. I'm someone's ANCESTOR! I'm now in the same spot on the family tree that my parents were for my children and my grandparents were for me. I'm someone's ANCESTOR! I've been 'doing the family tree' for over 30 years and hadn't really thought about my place on that tree. Yes I'm there; firstly as Matthew and Lilian's daughter; and as Arthur, Eveline, Thomas and Louisa's granddaughter but that was all. Today we celebrate our youngest grandchild's third birthday and it made me stop and think. Wow! I'm an ANCESTOR! It is a bit scary as I don't feel old enough to be that but my age tells me otherwise. So where are you on your family tree? Still a descendant or have you reached ancestor status? A GoONS Weekend. Part Two. A GoONS Weekend. Part One. Total Trivia: Clothes Pegs and Coat hangers.